President Xi Jinping called upon New Zealand not to discriminate against Chinese companies during a meeting with Prime Minister Jacinda Ardern, whose country has rejected a bid by Chinese telecom giant Huawei to build a 5G mobile network. Ardern, on a one-day visit to China, said before meeting Xi that she hoped to have a dialogue with Beijing about New Zealand's intelligence agency's decision to reject the bid. Meeting in Beijing's Great Hall of the People, Xi told Ardern that China has always regarded New Zealand as "a sincere friend and partner". Both countries must deepen mutual trust and understanding, seek common ground while putting aside differences, and respect each other's major concerns, Xi said, according to a statement from China's Foreign Ministry. "China is willing to continue to support strong companies to invest in New Zealand, and New Zealand should provide a fair, just, non-discriminatory operating environment for Chinese companies," it paraphrased Xi as saying. "This bilateral relationship is one of our most important and far reaching, a point that I've made in successive public speeches over the past year," she told reporters. "I look forward to discussions around the opportunity for us to further our partnership and indeed our critically important relationship. I welcome this opportunity to meet together and continue those discussions." In 2008, New Zealand became the first Western country to sign a free trade agreement with China and China is New Zealand's largest goods export partner. 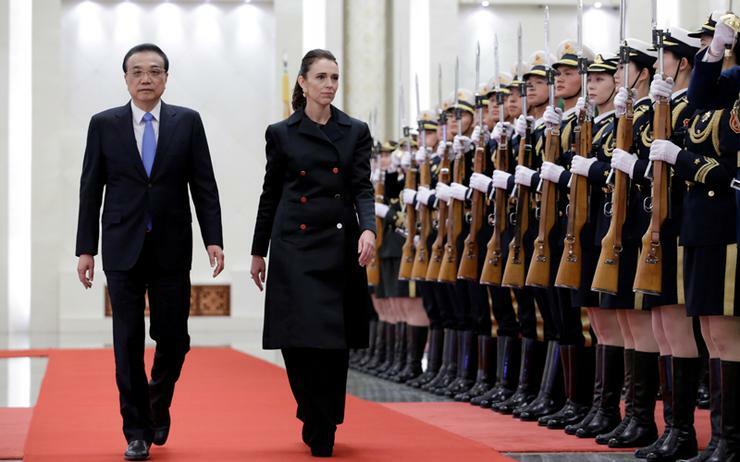 Ardern earlier met with Premier Li Keqiang. "I reiterated to Premier Li that New Zealand welcomes all high quality foreign investment that will bring productive economic growth to our country," she said in a statement. "We discussed the FTA upgrade, and agreed to hold the next round of negotiations soon and to make joint efforts towards reaching an agreement as soon as possible." Talking to reporters before meeting Li, Ardern said she would set out the process New Zealand followed in the Huawei decision, and point out that there had been no political or diplomatic influence in the matter. She said media reports suggesting Huawei was banned in New Zealand were not true. The interview with reporters was streamed on New Zealand's 1NEWS. Ardern has acknowledged there were complexities in the relationship with China, but has dismissed concerns of a rift with New Zealand's largest trading partner. The trip has been trimmed down to a one-day visit following an attack on two mosques in Christchurch on 15 March that killed 50 people.